Learn more about the Flir C3 thermal camera with reviews, pricing, a list of features, and frequently asked questions. 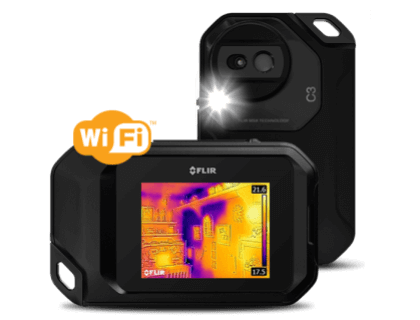 The Flir C3 Compact Thermal Camera is a handheld thermal imaging camera with Wi-Fi connectivity. The C3 is small enough to fit in your pocket and features a touch screen. Share images instantly over wi-fi. The Flir C3 Compact Thermal Camera with Wi-Fi costs $699.00. Pros: Compact design. Touch screen. Large storage capability. Cons: Expensive. Images are sometimes blurry. Bottomline: A reliable thermal imaging camera. However, the Flir ONE Pro is a much more affordable option. Box with max. or min. How do I charge the Flir C3 camera? The camera comes with a charging adapter that you can plug into a standard power outlet. How do I download images from the Flir C3? The Flir C3 can connect to wireless internet networks so that you can transfer your images to other devices. Can I used the camera to define measurements in my images? Yes. The C3 has a built-in measurement mode that allows you to measure within a defined area on your touch screen. What are some Flir C3 Compact Thermal Camera alternatives? Flir, C2 Powerful & Compact Thermal Imaging System. I bought a Flir C3 last summer on Amazon for about $600, works very well. Still finding new uses for it. It works every bit as well as the one on the snappy truck.